Zing! By Gorji Cookbook cover and inside page from the favorite building blocks of flavor section showing pomegranate and dill. With these three honors from the indie book awards community, Zing! By Gorji cookbook has received five top cookbook awards, four in cookbook categories and one for best book/author/publisher website. National Indie Excellence Awards (2 ) –International & Regional Cookbook Categories, USA Book News Award – International Cookbook Category, London Book Festival – International Cookbook Category and IPPY Independent Publishing Awards –Best Book/Publisher/Author Website. Zing! By Gorji, is part innovative cookbook, part autobiography and part guide to great culinary shopping tips and methods for creating “New Mediterranean cuisine” including how to use ingredients such as pomegranates, barberries, limes and sumac to infuse dishes with bold flavor. DALLAS—The Chef Gorji Cookbook by chef-owner of Canary By Gorji restaurant in Dallas,TX has swept the independent book world and received top book awards from members of the established independent publishing awards community. Zing! By Gorji – New Mediterranean Cuisine is part innovative cookbook, part autobiography and part guide to great culinary shopping tips and methods for creating “New Mediterranean cuisine” including how to use ingredients such as pomegranates, barberries, limes and sumac to infuse dishes with bold flavor. To date, Zing! By Gorji cookbook has taken home five top wards in book publishing contests, four in cookbook categories and one for best book/author/publisher website. Gorji has been chef-owner of Canary By Gorji, the intimate 10-table restaurant in Dallas, Texas for 14 years. 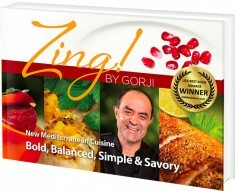 He has released an award-winning debut cookbook Zing! By Gorji that features his signature “New Mediterranean” cuisine. He launched Gorji Gourmet Foods® in 2006. The product line was developed to help home cooks easily make gourmet tasting dishes. They include Pomodoro sauce, Puttanesca sauce, Dipping Oil & Marinade and Pomegranate Vinaigrette, with the latest Arrabiata Diavolo being introduced in 2014. At ZestFest 2015, Arrabiata Diavolo, won gold for Best Pasta Sauce with the pomodoro and puttanesca taking silver and bronze. Arrabiata also won silver in Best New Product. They are available for purchase at metroplex Whole Foods Market®, area gourmet stores, amazon.com, artizone.com, organics2u.com and www.gorjigourmet.com.For more information please visit chefgorji.com. The Chef’s Cookbook honors, along with his expanding Gorji Gourmet Foods® line, add to Gorji’s culinary legacy. 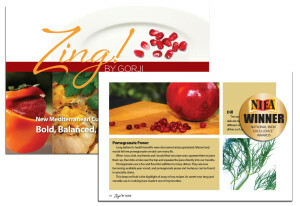 Chef Gorji’s first-ever cookbook, Zing! By Gorji – New Mediterranean Cuisine, has received top book awards from members of the established independent publishing awards community. It is part innovative cookbook, part autobiography and part guide to great culinary shopping tips and methods for creating “New Mediterranean cuisine” including how to use ingredients such as pomegranates, barberries, limes and sumac to infuse dishes with bold flavor. Gorji has been chef-owner of Canary By Gorji, an intimate 10-table restaurant in Dallas, Texas for the past 12 years and has published a debut cookbook, Zing! By Gorji featuring his signature “New Mediterranean” cuisine. In 2006 Gorji Gourmet Foods® was launched, and included Pomodoro sauce, Puttanesca sauce, Dipping Oil/Marinade and Pomegranate Vinaigrette. In December 2014 Arrabiata Diavolo was added to the line-up. He developed these to help home cooks easily make gourmet tasting dishes that don’t take a lot of time. For more information, please visit ChefGorji.com. No Replies to "Zing! By Gorji Cookbook Sweeps Indie Book Awards"